Cooking times may vary depending on: the temperature of the meat going into the oven, the accuracy of the oven’s thermostat, how many times the oven door is opened during cooking. Cook bone-in breasts, thighs, drumsticks and wings until a digital meat thermometer inserted into the meat, away from the bone, registers 165°F (74°C). Cook boneless cuts to an end-point internal temperature of 165°F (74°C), using a digital meat thermometer inserted deep into the meat. 2½ – 6 lbs (1 – 2 ½ kg) 1¾ – 2½ hrs. ¾ – 1½ lbs (340 – 680 g) ea. 1½ – 1¾ hrs. ¾ – 1¼ lbs (340 – 565 g) ea. 1¼ – 1½ hrs. ½ – 1½ lbs (225 – 680 g) ea. (sm.) (lg.) (lg.) 1½ – 1¾ hrs. 4 – 7 lbs (1.75 – 3 kg) 1½ – 2½ hrs. 2 – 5 lbs (900 g – 2.25 kg) 1¾ – 2 hrs. 1.6 – 2.6 oz (45 – 75 g) ea. 4 – 6 min. Sizes vary – cook to 165°F (74°C) end-point temperature. Follow package directions. * Time will vary greatly depending on method used, thickness of meat, temperature of barbeque, and weather conditions. Whenever possible, rely on a digital meat thermometer to determine doneness. For whole bird, the thermometer placed in thickest part of the breast must register 170°F (77°C) in the breast, or 180°F (82°C) in inner thigh, and should not touch bone. For turkey cuts, ground turkey, sausages and hot dogs, the thermometer must register 165°F (74°C). Barbeques should be kept closed as much as possible while cooking turkey cuts. 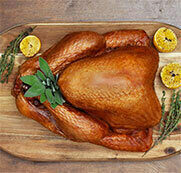 Never re-use tools, plates or platters that touched raw turkey. Use the temperatures noted above to determine when turkey cuts are cooked safely on the barbeque. Check out our Get Grilling section for delicious recipes ideas.